Fiber-coupled laser modules for the best possible beam quality. In FLEXPOINT® MVfiber laser systems, the laser unit with control electronics is connected to the optical unit by a single-mode optical fiber. Because the electronics can be integrated separate from the smaller optical unit, the laser can also be used in areas with a limited amount of space. This separation results in a reduced thermal effect on the optical part and thus almost completely prevents a thermal drift of the laser position. The use of a single-mode fiber leads to improved optical properties. It produces less scattered light and prevents side modes that would otherwise lead to disruptive effects in laser projection. 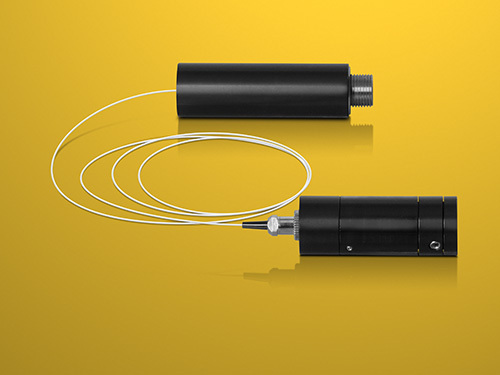 The laser source and the optical head are designed for use with FC/PC connectors and can be ordered separately, providing customers with maximum flexibility in selecting the right system. The lasers are available at 450 nm and 660 nm with power levels of up to 50 mW; other wavelengths or output power levels are available upon request. The optical head can be equipped with homogeneous lines, lines with a Gaussian distribution, dot projection, or DOE optics (parallel lines, dot matrices, circles, etc. ).